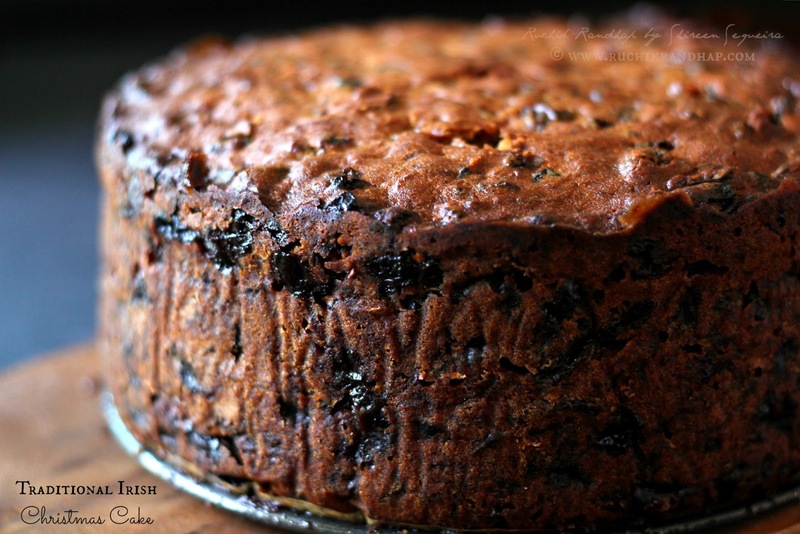 A couple of months ago I shortlisted the recipe of the Christmas cake I was going to bake this year. 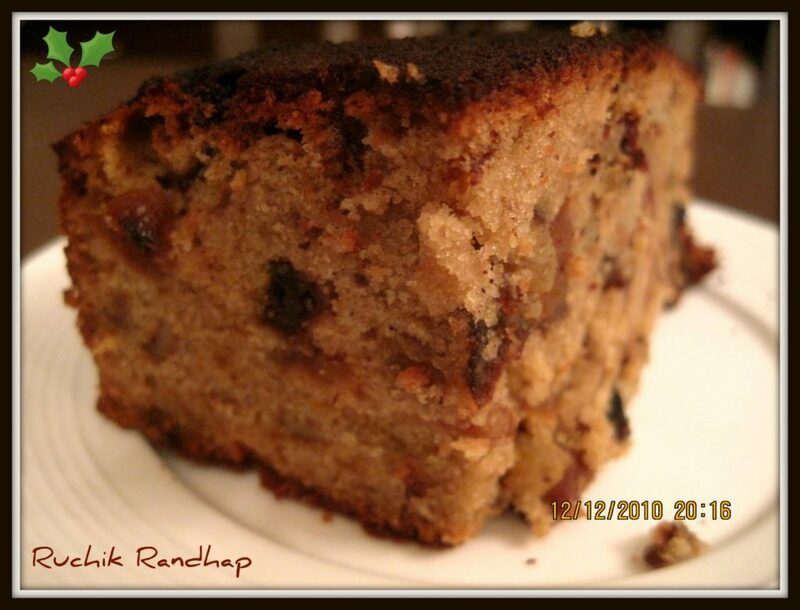 Not so much in favour of boozy cakes I decided to bake my cake a few days before Christmas day but everything changed the minute I set my eyes on this recipe which my cousin Prema shared with me over a chat on whatsapp. She and I love to discuss cakes and bakes and every year we discuss and shortlist recipes for Christmas. Sharing of ideas helps as the internet is so huge now and it’s just impossible to scan all the recipes single handedly. The recipe looked easy and the amount of fruit that was required wasn’t as much as that in my previously shortlisted recipe. The outcome would be the same infact better I am sure as this cake now needs a total of 4-5 feeds over a span of a month. Perfect timing, I thought to myself. I baked this two days ago and wanted to share the recipe immediately but got caught up with my chores. 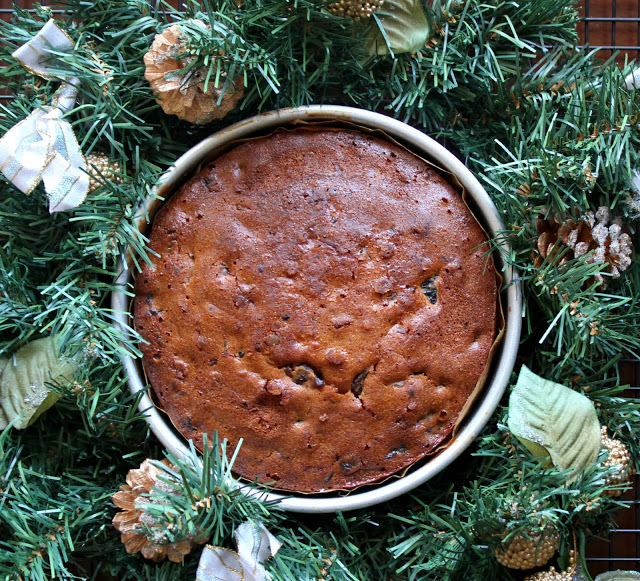 If you want to get into the Christmas mood a little early this year, go make this cake this weekend. 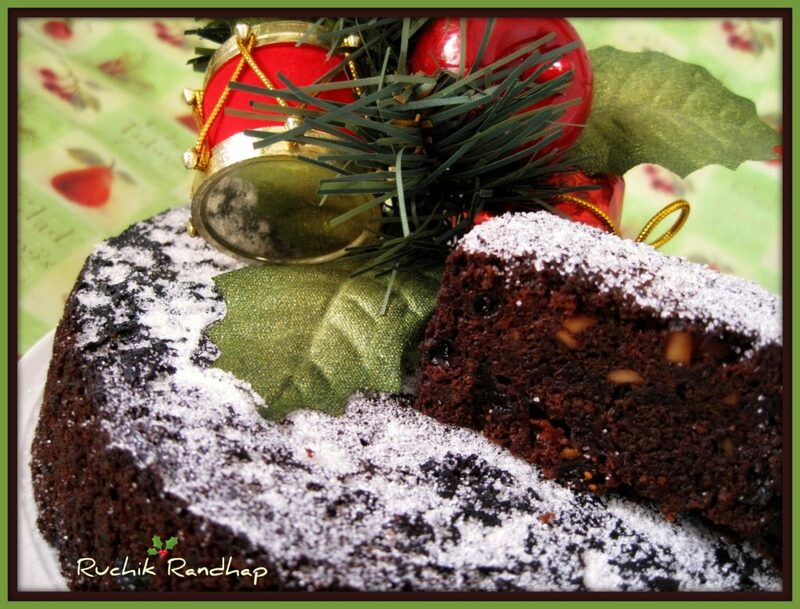 You will still have 4 weeks before you cut the cake for Christmas – enough time to give the cake its boozy feeds. If you dislike the alcohol in it just skip it. 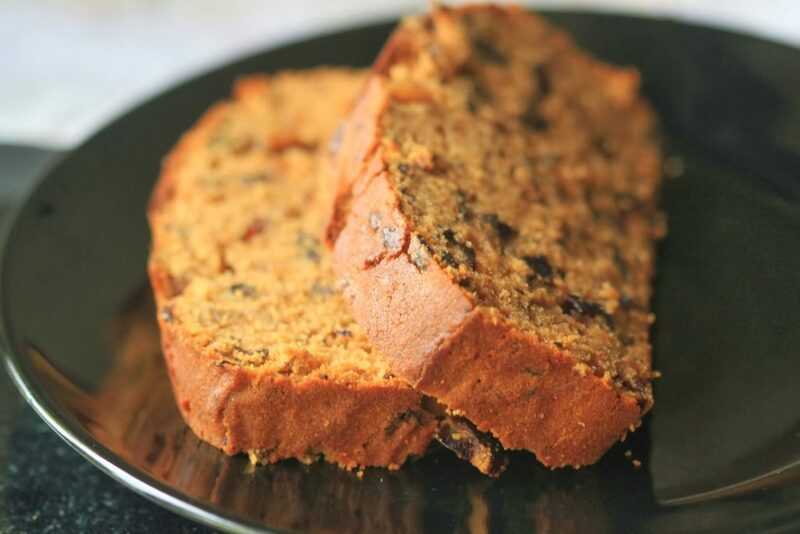 Soak the fruits in everything except the alcohol and bake the cake a couple of days prior to cutting it so that it gives it a little rest and helps the flavours mature a bit. In the picture collage above notice how tall the sides of the pan need to be and how raised the baking parchment needs to be. The first picture also shows a cover for the cake made out of parchment with a little cross mark in the centre to let out the steam. This is an important step. To show the difference in the linings I have used baking parchment of two colours (brown and white). The third picture shows how the inner lining needs to be raised as well because the batter is quite a bit and we don’t want it spilling over or the cake forming a muffin shape during the baking process. I have used a springform pan which has tall, straight sides unlike other baking pans that have a bit of curved sides or handles. 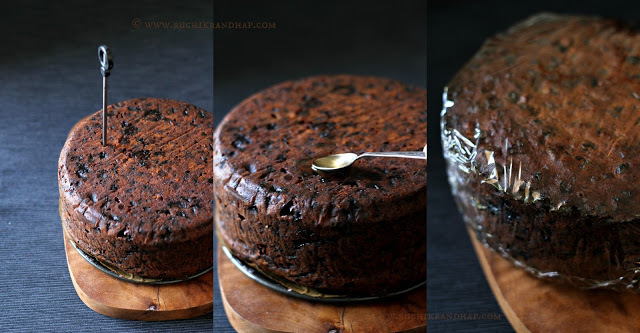 This picture collage shows how the cake needs to be turned upside down before poking it in a few places with the help of a long skewer (I have used a metal one here, you may use wooden ones used to string kebabs). The cake is then fed alcohol and finally wrapped in cling film or foil and stored in an airtight container. This process has to be repeated every 10 days in the runup to Christmas. I will update this post with the final pictures of the cake after I have decorated it – perhaps 2 days before Christmas, so do drop by again to see how the cake looks. I will give a full review of the cake and how it tastes after I’ve tasted it 🙂 I decided to post the recipe anyway if it helps someone. 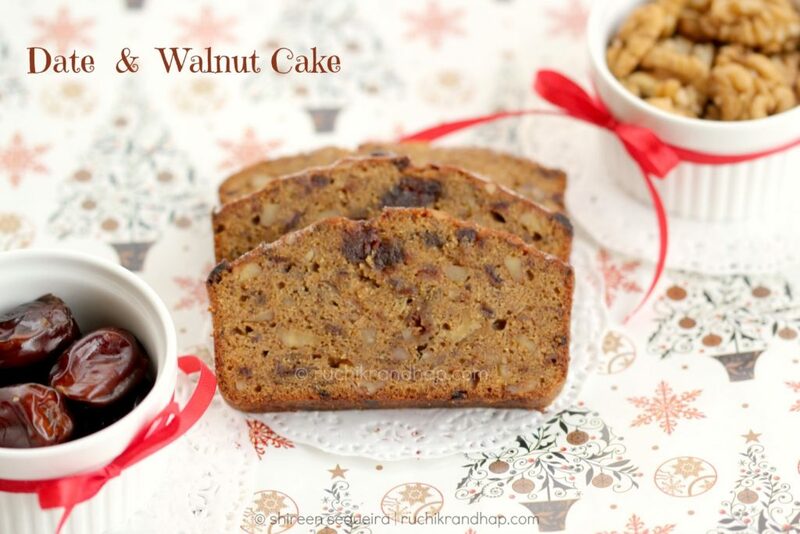 Thank you Prema for sharing this recipe with me! For more Christmas cake recipes please scroll down to the bottom of this post! Roughly chop the sultanas, raisins and currants. Finely chop the candied peel. Halve the glacé cherries if they are whole. Don't chop them. Place all these dry fruits along with the rest of the ingredients mentioned under For the fruit Mix (To be soaked overnight) in a big bowl, mix well and cover with cling wrap. You will need an 8" square or a 9" round pan with tall, straight sides, preferably a spring form pan. Make sure that the pan does not have handles/flat on the sides (like the one's by Prestige brand). This is because you will need to cover the sides of the baking tin with baking paper to prevent the cake from burning. Grease and line the base of the baking tin with baking parchment. Next, grease and line the sides of the pan with baking parchment that extends a little over the sides (the sides of the paper should be higher than the sides of the tin - this is because your cake will rise much above the depth of the cake so you don't want it to spill over or form a muffin top). Take two long sheets of baking paper and fold them in half, horizontally and cover the tin on the outside and fasten it with a string (I managed this with stapler pins - but make sure the pins don't come lose and fall into your batter!). Your cake tin will be invisible by now. Basically you are securing the tin in such a way as if a crown or a chef's hat has been placed around it. Cut an extra round or square piece of baking parchment and cut a cross mark in the centre. This sheet will be placed right on top of your tin to protect the batter from browning too fast. Preheat oven to 150 degrees C (or 140 C if you are using a fan oven). In a large bowl beat the butter and the sugar until the mixture looks pale. Add the eggs one by one beating between each addition. If the mixture looks like it is curdling then just add a tablespoon or two of flour. When all the eggs have been beaten, add the flour in parts and fold it into the mixture using a spatula. Now mix the soaked fruits in parts, folding to incorporate. Any remaining liquid of the fruits needs to be added as well. Cover the top of the tin with the extra round/square sheet of baking parchment and bake for approximately 2-1/2 to 3 hours. The baking time may vary depending on the type/size of your oven. The original recipe called for 3-1/2 to 4-1/2 hours but I kept an eye on the cake after 1 hour 15 mins and checked it every 20 mins thereafter. When the skewer inserted inside comes out clean the cake is done. 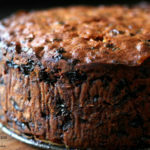 If you wish to feed the cake in the runup to Christmas, then place the cake upside down and poke 5-6 deep holes using a wooden skewer. Pour 1/2 teaspoon of whiskey into each of the holes. When you are ready to serve, ice the cake with marzipan (recipe to follow) and serve! Roughly chop the sultanas, raisins and currants. Finely chop the candied peel. Halve the glacé cherries if they are whole. Don’t chop them. Place all these dry fruits along with the rest of the ingredients mentioned under For the fruit Mix (To be soaked overnight) in a big bowl, mix well and cover with cling wrap. 1. You will need an 8″ square or a 9″ round pan with tall, straight sides, preferably a spring form pan. Make sure that the pan does not have handles/flat on the sides (like the one’s by Prestige brand). This is because you will need to cover the sides of the baking tin with baking paper to prevent the cake from burning. 2. Grease and line the base of the baking tin with baking parchment. Next, grease and line the sides of the pan with baking parchment that extends a little over the sides (the sides of the paper should be higher than the sides of the tin – this is because your cake will rise much above the depth of the cake so you don’t want it to spill over or form a muffin top). 3. Take two long sheets of baking paper and fold them in half, horizontally and cover the tin on the outside and fasten it with a string (I managed this with stapler pins – but make sure the pins don’t come lose and fall into your batter!). Your cake tin will be invisible by now. Basically you are securing the tin in such a way as if a crown or a chef’s hat has been placed around it. 4. Cut an extra round or square piece of baking parchment and cut a cross mark in the centre. This sheet will be placed right on top of your tin to protect the batter from browning too fast. 1. Preheat oven to 150 degrees C (or 140 C if you are using a fan oven). 3. In a large bowl beat the butter and the sugar until the mixture looks pale. Add the eggs one by one beating between each addition. If the mixture looks like it is curdling then just add a tablespoon or two of flour. 4. When all the eggs have been beaten, add the flour in parts and fold it into the mixture using a spatula. 5. Now mix the soaked fruits in parts, folding to incorporate. Any remaining liquid of the fruits needs to be added as well. 7. Cover the top of the tin with the extra round/square sheet of baking parchment and bake for approximately 2-1/2 to 3 hours. The baking time may vary depending on the type/size of your oven. The original recipe called for 3-1/2 to 4-1/2 hours but I kept an eye on the cake after 1 hour 15 mins and checked it every 20 mins thereafter. When the skewer inserted inside comes out clean the cake is done. 1. If you wish to feed the cake in the runup to Christmas, then place the cake upside down and poke 5-6 deep holes using a wooden skewer. Pour 1/2 teaspoon of whiskey into each of the holes. 4. When you are ready to serve, ice the cake with marzipan (recipe to follow) and serve! 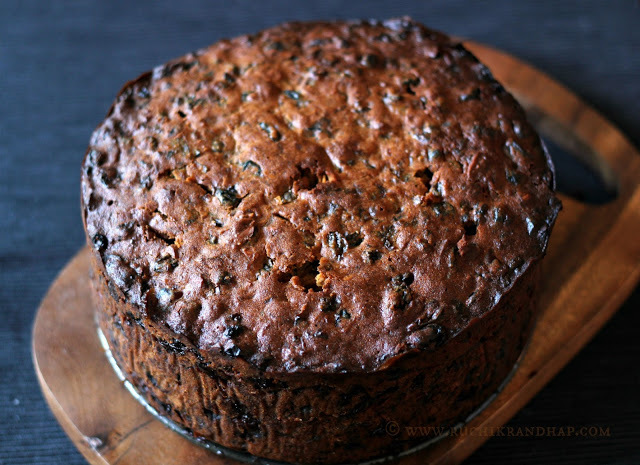 Christmas Cake – The Ultimate Winner!! 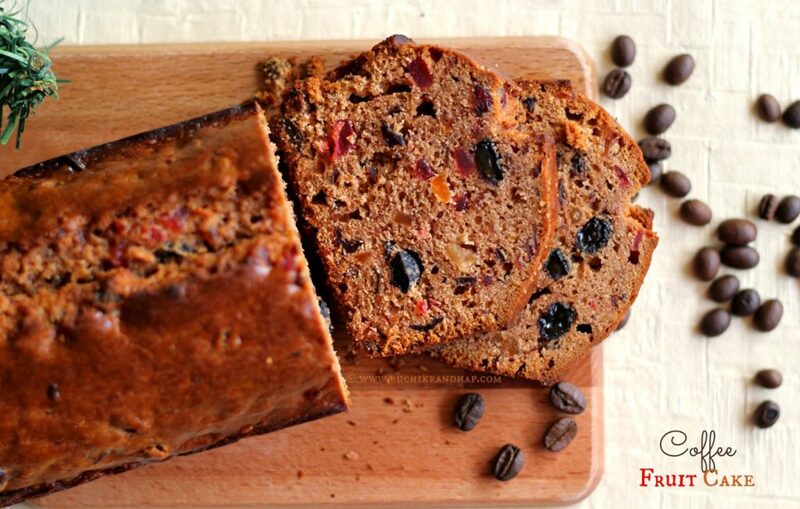 Thank you so much Shireen for this precious recipe.It is super. I made it today with some changes in the fruits. Added dates, cranberries tutti frutti. Just summed up to the total amt of fruits.It took me around2-1/2 to 3 hrs.The house is filled with a wonderful aroma right now.I do have some recipes for fruit cake but this one beat's them all. Now I will follow only this recipe. Also I did not have irish liquor so I added Rum.Thank you once again. Shireen , I wanted to know since I am in Mumbai do I now keep the cake on the kitchen counter in an airtight box or in the fridge? Shireen, could you please give me an alternate to Irish Whiskey? Like can i use any other normal whiskey or single malt whiskey's?? Hey Shireen, what a wonderful recipe. 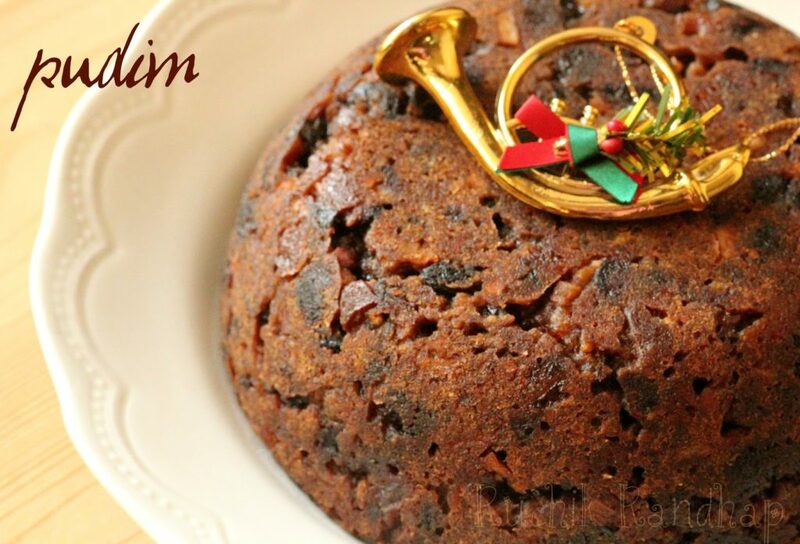 Tried it for Christmas and it was a lovely experience baking it and enjoying all the compliments. This is a definite keeper. Thanks for sharing it!! With all the pictures, makes it easy to follow. Hi Shireen, what brand of golden syrup do you recommend?